Always note and record the unusual…Publish it. Place it on permanent record as a short, concise note. Such communications are always of value. Among the many reasons that explain the popularity of case reports, the main one is probably the accessible nature of this particular piece of clinical information. 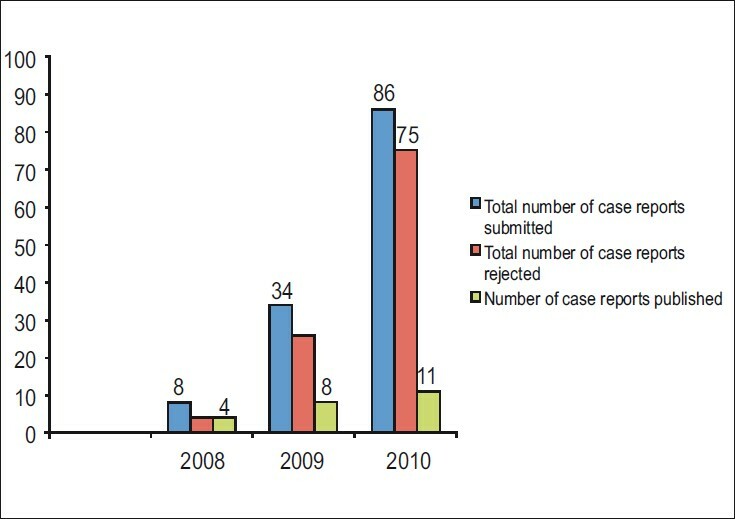 Symbol of the high popularity in the Journal is the continuous rise in the number of case report submissions [Figure 1]. The Journal has always witnessed a steady stream of case reports, but over the last years the number has increased significantly. This year we received 86 case reports, and this represented a tenfold increase in comparison with 2008. Figure 1: The number of manuscripts that are submitted as a case report to the Journal of Conservative Dentistry in comparison with the number of manuscripts that were accepted for publication and those that were rejected for the period 2008-2010. The Journal of Conservative Dentistry receives more case reports than it can publish. Unfortunately, although many of these manuscripts are academically worthy, they are too poorly written to merit acceptance. Some manuscripts are considered beyond salvage, and these are rejected outright. Other manuscripts pass through one or more rounds of peer review before an editorial decision is taken. In both these situations, and especially in the latter, the editorial office and the reviewers of the manuscripts are taxed, this wastes time and resources, and the waste is a complete loss for all involved if the manuscript is eventually rejected. This article seeks to help and guide authors to understand how to prepare a reasonable and well-written case report. Writing a good research paper is an art that requires skills in both academic and literary domains. Articles that are better in quality at the time of original submission will stand a higher chance of acceptance. This article hopes to help authors to better understand the nuances involved in the preparation of a case report and how they may anticipate concerns that peer reviewers may express when scrutinizing their manuscript. The objectives of this article are to improve the chances that authors will receive a favorable review for their own manuscripts, and to thereby reduce the burden that the reviewers and editorial office of the Journal of Conservative Dentistry experience with submissions that require extensive and repeated rounds of revision. A unique case that may represent a previously unknown syndrome or disease. A case with the previously unreported association of two distinct diseases, suggesting a possible relationship between them. An "outlier" with features strikingly outside the realm of what is usually seen with a particular disease. An unexpected response or course suggesting a previously unrecognized therapeutic or adverse effect of intervention. A previously unreported finding in a rare condition that suggests a possible pathogenetic mechanism. A new manifestation or finding, or clearer demonstration of a known feature of a disease, using a new technology or method. Demonstration, by means of modern technology, of known physiologic principles through the findings in a patient with a rare condition. A clinically important hazard or potential problem associated with the use of a diagnostic or therapeutic device or material. What does an Editorial Office Look for in a Submission? Only 9 (6%) journals considered the hypothesis generation a reason for reporting the case. 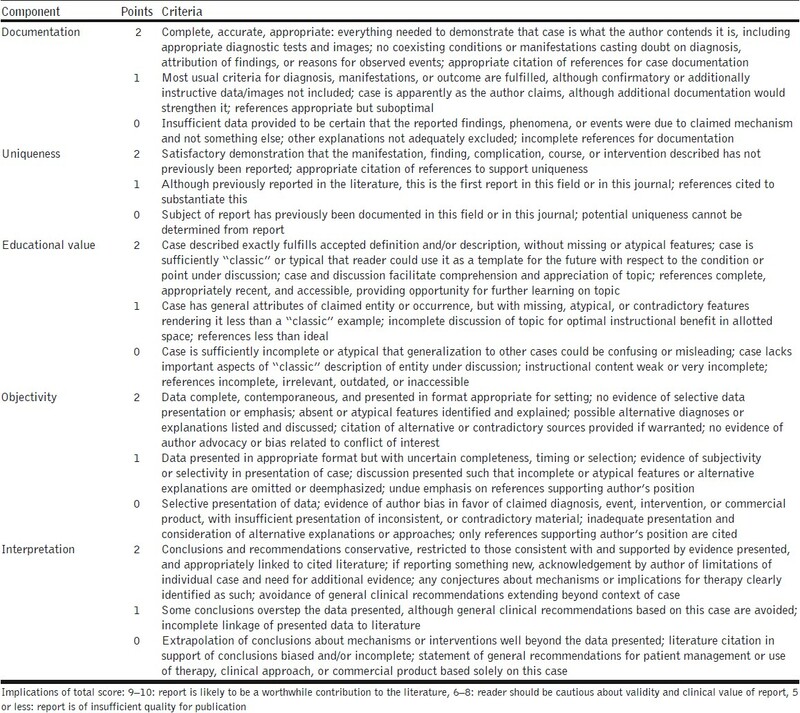 Journal editors differ in what they look for in a submission, but a review of the instructions to authors in 163 medical journals revealed a median limit of 1000 words, eight references, and six authors for case reports. Approximately, 90% of the journals requested an abstract and key words. In this era of electronic databases, it is essential that you provide this information if you want your report to be accessible to the reader. Sixty-one percent were looking for the unusual or rare content, while 55% requested that the content should be instructive. In your cover letter to the editor, make sure that you sell your manuscript by articulating the salient educational message. Brevity and clarity are essential assets if a submission is to meet the journal's space requirements and retain the reader's interest. What happens with the case report once you submit it? First, the Editorial Office checks whether the manuscript meets the technical standards and that it is complete. If so, your manuscript moves to the next stage, and that is the editorial board meeting. Here we discuss your paper and judge whether it meets the standard of the Journal. This is a major hurdle, and we have to admit that not many manuscripts get beyond this stage. Next, we send your paper out for review, and after a receipt of the referee reports, one of the editorial board members issues a recommendation. The Editorial Board discusses the paper again, in view of the recommendation. If we agree that the case report is potentially interesting, we ask you to write a rebuttal and change the manuscript according to the issues raised by the reviewer. Now we have come to the final stage and here the editorial board member checks whether the referee's issues have been dealt with. If there is any doubt at this stage, the paper can be rejected or we get back to you with additional questions. Finally, if you manage to get beyond this stage, your paper is accepted in the Journal and you can await publication. 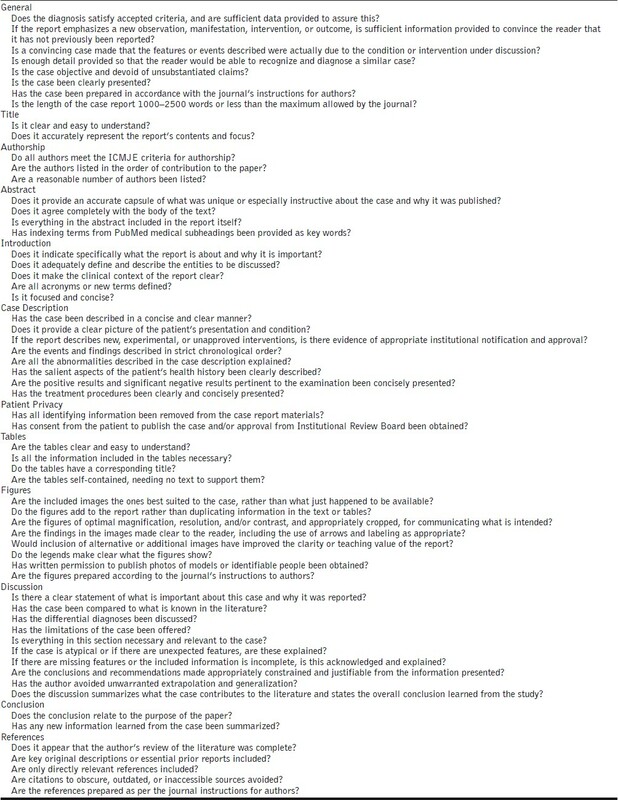 The following section would deal on the essential basic nuances in the compilation of a case report. Case reports should be short and focused, with a limited number of figures and references. There are usually a restricted number of authors. The structure of a case report usually comprises a short unstructured (or no) abstract, brief (or no) introduction, report of the case, and discussion [Table 1]. Unlike original articles, case reports do not follow the standard IMRAD structure of the manuscript organization. As there is a wide variation in the format for case reports among different journals, it is essential for authors to follow exactly the target journal's Instructions to Authors. The title should accurately and succinctly describe the case, and be sufficiently informative to interest the reader. Redundant words such as "case report" or "review of the literature" should be omitted. Clever or artistic titles should not be used because it is confusing and makes it difficult for the reader to determine the focus of the paper. He/she has provided substantial contributions to conception and design, or acquisition of data, or analysis and interpretation of data. He/she has drafted the article or revised it critically for important intellectual contents. For some journals, no abstract is needed for case reports. If required, the abstract should be unstructured, and provide enough essential information for other researchers doing a database search. Abstracts for case reports are generally shorter than for other categories of papers, and are typically 100 words or less in length. Use terms found in the Index Medicus database, which are called medical subheadings (MeSH). MeSH can be found at the PubMed home page (http://www.ncbi.nlm.nih.gov/entrez/query.fcgi?db=mesh). A list of additional words that may be unique to the case or to the topic are also discussed. The introduction section must state clearly why the case report is worth publishing and reading, not only because a statement of rationale is intrinsically logical but also because busy clinicians are unwilling to read an article if they cannot anticipate its interest or relevance to them and their practice. The acceptable case report makes a contribution by illustrating a useful new approach to the diagnosis or the management of a condition or by offering a new insight into the pathogenesis of a disease. The introduction section should also contain some evidence from the literature to substantiate the authors claim that the case is important. In writing a case report, the order of events should be presented in chronological order, typically comprising clinical history, physical examination findings, investigative results, differential diagnosis, working diagnosis, management, follow-up, and final diagnosis. Clarity is essential, especially with regard to important findings, all of which should be reported honestly. The presenting signs and symptoms should be objectively described, together with the relevant past dental history. Preserving patient confidentiality is paramount. It is important that the patient is not identifiable from the information contained in the text of the case report. In the accompanying images, authors should make every effort to remove or conceal all identifiable features, taking particular care with the head and face. The eyes should be blanked out, and any birthmarks or tattoos concealed. It is preferable to obtain a written informed consent from the patient or parent/guardian (if the patient is a minor) giving permission to publish the case report and accompanying images. The discussion section serves to explain, clarify, and interpret key findings, and should be brief and to-the-point. An overview of the typical management may be required. The authors may suggest or explain their hypothesis, and express their own opinion here. A commentary that puts the case in context of other similar cases or explains specific management decisions is useful. Any shortfalls or limitations of the case should be stated. The value that the case adds to the current literature should be highlighted, so should differences between the reported case and other similar cases. Authors should also try to indicate the direction for future investigation, or the diagnosis or management of similar cases. In the last paragraph, the main conclusions of the case report, and an explanation of its importance or relevance should be provided. The take-home points should be emphasized, with focus on the main learning points, which should relate to the purpose for reporting the case. A case report check list [Table 2] is being provided for future authors to use as a form of self-evaluation prior to submitting a manuscript to a journal to determine if further work is necessary before submission. 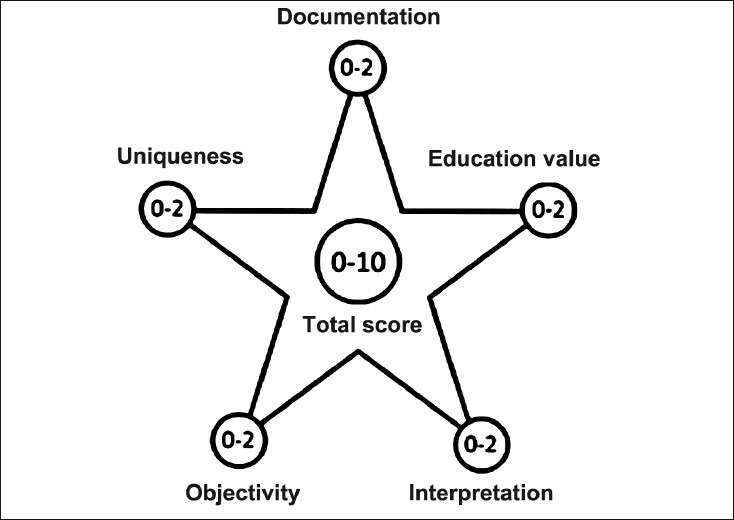 Pierson  has formulated a conceptual scheme with component domains for evaluating the quality of a case report [Figure 2] and [Table 3]. The value of individual case reports should be kept in perspective in the larger context of the scientific literature. Appropriately viewed, however, the case report remains an important cog in the wheel of medical progress, which can stimulate clinicians' interest, generate further research, or serve as a helpful educational tool. The application of the principles summarized in this article can help a potential author to prepare a case report in a more acceptable format and would help the reader to approach case reports critically and gain maximum benefit from them. A case report will not have as much potential impact on the science or practice of health care as a randomized controlled trial or other research projects. However, it may be the only way to make others in the field aware of unusual presentations or complications, and it is a time-honored vehicle for teaching others. New syndromes, manifestations, associations, complications, or outcomes are appropriate subjects for case reports, as are typical and exceptionally well-documented examples of known entities that are relevant to a journal's readers. There should be a clear learning point. 1. Janicek M. Clinical case reporting in evidence-based medicine. Oxford: Butterworth-Heinemann; 1999. 2. Fenton JE, Khoo SG, Ahmed I, Ullah I, Shaikh M. Tackling the case report. Auris Nasus Larynx 2004;31:205-7. 3. Cohen H. How to write a patient case report. Am J Health Syst Pharm 2006;63:1888-92. 4. McCarthy LH, Reilly KE. How to write a case report. Fam Med 2000;32:190-5. 5. Iles RL, Piepho RW. Presenting and publishing case reports. J Clin Pharmacol 1996;36:573-9. 6. Chelvarajah R, Bycroft J. Writing and publishing case reports: the road to success. Acta Neurochir (Wien) 2004;146:313-6. 7. Kljakovic M. Single cases in general practice and general medical journals. Aust Fam Physician 2002;31:669-73. 8. Hess DR. What is evidence-based medicine and why should I care? Respir Care 2004;49:730-41. 9. Durbin CG Jr, Schwenzer KJ. The spectrum of respiratory care research: Prospective clinical research. Respir Care 2004;49:1165-70. 10. Hess DR. Retrospective studies and chart reviews. Respir Care 2004;49:1171-4. 11. Rubenfeld GD. Surveys: an introduction. Respir Care 2004;49:1181-5. 12. Wright SM, Kouroukis C. Capturing zebras: What to do with a reportable case. CMAJ 2000;163:429-31. 13. Morgan PP. Why case reports? CMAJ 1985;133:353. 14. Coccia CT, Ausman JI. Is a case report an anecdote? In defense of personal observations in medicine. Surg Neurol 1987;28:111-3. 15. Morris BA. The importance of case reports. CMAJ 1989;141:875-6. 16. Huth EJ. Writing and publishing in medicine. Baltimore: Lippincott Williams and Wilkins; 1999. p. 103-10. 18. Rachana D, Nadig P, Nadig G. The palatal groove: Application of computed tomography in its detection - A case report. J Conserv Dent 2007;10:83-8. 19. Tandri SB. Management of infected radicular cyst by surgical decompression. J Conserv Dent 2010;13:159-61. 20. Chakradhar Raju RVS, Sathe N, Morisetty P, Veeramachaneni C. Endodontic management of a maxillary first molar with unusual location of second mesio buccal orifice. J Conserv Dent 2010;13:162-4. 21. Asgary S. Furcal perforation repair using calcium enriched mixture cement. J Conserv Dent 2010;13:156-8. 22. Sorinola O, Olufowobi O, Coomarasamy A, Khan KS. Instructions to authors for case reporting are limited: A review of a core journal list. BMC Med Educ 2004;4:4. 23. Gopikrishna V, Datta K, Nandini S. Journal of Conservative Dentistry is now PUBMED indexed. J Conserv Dent 2010;13:1. 24. International Committee of Medical Journal Editors (ICMJE). Uniform requirements for manuscripts submitted to biomedical journals: writing and editing for biomedical publication. Philadelphia: ICMJE; Available from: http://www.Icmje.org [updated on 2006 Feb; cited 2006 Oct 1]. 25. Har-El G. Does it take a village to write a case report? Otolaryngol Head Neck Surg 1999;120:787-8. 26. Fenton JE, Khoo SG, Ahmed I, Ullah I, Shaikh M. Tackling the case report. Auris Nasus Larynx 2004;31:205-7. 27. Stewart KJ. Respiratory care in the computer age. Respir Care 2004;49:361-4. 28. United States Department of Health and Human Services. Summary of the HIPAA privacy rule. Available from: http://www.hhs.gov/ocr/hipaa [last accessed on 2010 Oct 30]. 29. Pierson DJ. Case reports in respiratory care. Respir Care 2004;49:1186-94.